Alice Walker began 1982 with Virginia Woolf. Walker would spend the year recording events, plans, and phone numbers in spiral-bound pages of a calendar she had acquired filled with photographs of Woolf and her contemporaries. 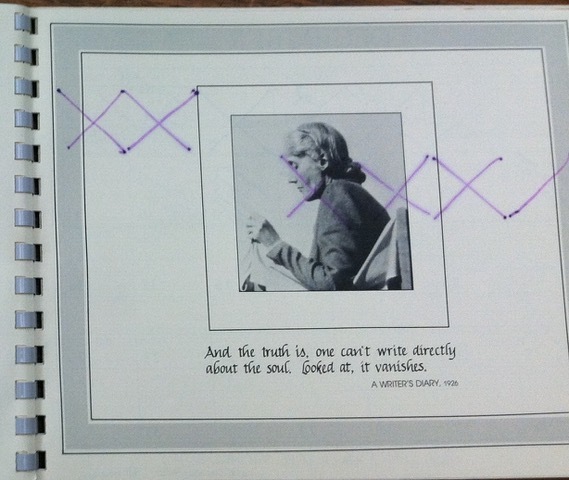 As Walker crossed out days, her purple ink seeped through one page, partly obscuring Woolf’s photograph on the verso (fig. 1). The lines meet Woolf’s likeness, a purple X just passing her eye. The range of inks that Walker used throughout her calendar suggest that this was chance, but the ink also recalls Walker’s novel published the same year, The Color Purple; likely unbeknownst to Walker, it was also a color in which Woolf preferred to write. It is the materiality of circumstance that makes this artifact a vestige of mass culture, everyday life, and artistic creation. Fig. 1. “Appointment book, 1982.” Alice Walker Papers, MSS. 1061, Stuart A. Rose Manuscript, Archives, and Rare Book Library, Emory University. Walker’s calendar is housed with her papers in Emory University’s Stuart A. Rose Manuscript, Archives, and Rare Book Library. Scholars are familiar with Walker’s response to A Room of One’s Own in her essay, “In Search of Our Mothers’ Gardens.” In it Walker seeks the voices of African American women writers, those whom Woolf does not address. Walker had taught the fiction of Zora Neale Hurston, Nella Larsen, Toni Morrison and others in courses on Black Literature in America at Wellesley College and the University of Massachusetts at Boston in the spring of 1972. Turning to her Woolf Calendar, we can see Walker as a consumer of the ephemera indexing the commodification of modernist writers like Woolf. In this calendar, Woolf’s presence becomes a backdrop for Walker’s negotiation of daily life. Sara Crangle has pointed out that such minutia fill Virginia and Leonard Woolf’s “engagement” and “pocket diaries” housed at the University of Sussex. These calendars record the Woolfs’ collective management of their home and business life, what Crangle calls their “domestic economy” (“Woolfian Domestic Economies,” 142). Years later, Walker’s calendar fulfills a similar role, albeit with Woolf at the periphery. As such, Woolf’s presence becomes inseparable from considerations of Walker’s calendar as an artifact. Ultimately, it dramatizes the process by which the emergence of the new means the cancellation of what came before. The image in figure 1 almost crosses Woolf out, but not quite. The calendar pairs the photograph of Woolf at Monks House with lines from A Writer’s Diary that date from 1926: “And the truth is, one can’t write directly about the soul. Looked at, it vanishes.” The sentiment too becomes emblematic of the calendar from which it comes. It is a remnant of process, evidence of lived reality and the navigation of space. Walker refers to The Color Purple as “Purple” (underlining in the original) on November 11. On July 12, she documents that the novel “has sold 10,725 copies.” There is also a glimpse of her family life as her daughter adds her birthday. Calendars structure writers’ lives. Cristanne Miller has addressed Marianne Moore’s calendars as a resource, and scholars have mined Sylvia Plath’s 1962 Letts Tablet Diary, its contents ranging from daffodil sales to radio broadcasts. In Walker’s case, we may want more evidence of her responses to the Woolf photographs and quotations. We cannot know whether they served as tacit inspiration, as ultimately what take precedence are the events arranged, information quickly collected, and numbers added. The partially cancelled image of Woolf is Walker’s reaction to her predecessor. Amy E. Elkins has argued that the en dehors garde, an avant-garde that is more inclusive, is an art of the overturned, the reverse of that we have known. In “Craft as Negative Space,” Elkins takes the example of turning over H. D.’s tapestries, finding that “[t]he negative turns an image en dehors. The negative and positive together are necessary, but so often we only focus on the positive, the finished thing over the thing-in-process.” She concludes that “[a]n en dehors garde archive reveals the literary objects forgotten on the flip side.” This expanded archive was what Woolf sought in A Room of One’s Own, but Walker’s accidental defacement of Woolf’s photograph also draws attention to the ways that Walker transcends Woolf. While Woolf had not been a student at either Newnham or Girton, the Cambridge colleges where she gave the lectures that became A Room of One’s Own, Walker had attended two women’s colleges. She studied at Spelman College in Atlanta, Georgia before completing her education at Sarah Lawrence College in Bronxville, New York. It was at the latter that Walker took Contemporary Writers and the South with the poet Muriel Rukeyser in 1964. In Rukeyser’s class, Walker composed a short story called “The Trip,” which is in her archive at Emory. A version of this story, recounting a women’s college student’s experience returning to Georgia for her father’s funeral, was later published as “A Sudden Trip Home in the Spring,” and dedicated to “the Wellesley class.” Expanding the story, Walker added the protagonist’s critique of the limited sense of the modernist literary canon at the women’s college she attends. In doing so, Walker may have been drawing on her recent experience teaching texts by African American women writers at Wellesley, redefining the textual landscape that students encountered. Early in “A Sudden Trip Home in the Spring,” Sarah Davis confides to a classmate she is “thinking . . . of the child’s duty to his parents after they are dead” (251). Sarah is recalling Richard Wright, and realizes, “I forgot . . . they don’t teach Wright here” (252). She persists, speaking almost to herself: “‘why Tears Eliot, Ezratic Pound, and even Sara Teacake, and no Wright?’ She and Pamela thought e.e. cummings very clever with his perceptive spelling of great literary names” (252). While Sarah fills her dorm room with images of Gauguin and Picasso paintings, she is frustrated with her inability to paint or draw African American men. Following her visit home, she comes to understand that she should turn to sculpture, and “shall soon know how to make my grandpa up in stone (261; italics in original). Her modernism becomes physical and material, seeking to capture strength and endurance. The texts that Walker taught by women writers told such stories. When Walker taught Black Literature in America at Wellesley in 1972, she ordered her course books—Larsen’s Quicksand (1928), Hurston’s Their Eyes Were Watching God (1937), Ann Petry’s The Street (1946), Gwendolyn Brooks’s Maud Martha (1953), Paule Marshall’s Brown Girl, Brownstones (1959) and The Timeless Place, The Chosen People (1969), Morrison’s The Bluest Eye (1970), and Walker’s own The Third Life of Grange Copeland (1970)—from Hathaway House bookstore. Walker brought these books not only to the classroom, but also to the bookstore where Plath paid a quarter in 1947 for Robert Frost’s poems, and where Anne Sexton, who lived in nearby Newton, once worked on her way to becoming a professional writer. Bookstores provide an anchor for the consumer life of books, and the materials of college courses. They are a part of the economy of curricula, influencing a new generation of students. The Woolf calendar that Walker inscribed a decade after she taught at Wellesley was a different kind of commodity. It is a relic of celebrity or fan culture, one that readers might purchase, knowing it was produced for a popular audience. Jeremy Braddock has addressed the ways in which Claude McKay’s archive collects Nancy Cunard’s celebrity, and we see a similar case here in Walker’s ownership of Woolfiana. While McKay curated more of a collection as such, Walker’s calendar also had a functional role. In it, she documented the practicalities of art in the present. The photograph that Walker marked in her calendar approaches its subject indirectly. In profile, Woolf is focused. We cannot know her thoughts, but we may wonder what the image would look like if it were taken from a different angle, and if the setting or other people were visible. Holding what may be the cloth back of a chair, Woolf returns us to the material. The calendar’s impression of Woolf and Walker’s accidental encounter is intertwined with mass production and celebrity. We care about this artifact because it draws both women writers of notoriety together, converging aesthetically in purple ink, archiving art and life. I would like to thank Amy E. Elkins and Elizabeth J. Donaldson for their feedback on drafts of this piece. The calendar was designed and edited by Martha H. Starr and Elizabeth W. Hill (New York: Harcourt Brace Jovanovich, 1981). The photograph is acknowledged in the calendar as: “Virginia Woolf photographed at Monk’s House.” It had previously appeared in George Spater and Ian Parsons, A Marriage of True Minds: An Intimate Portrait of Leonard and Virginia Woolf (New York: Harcourt Brace Jovanovich, 1977). “Appointment book, 1982,” box 214, folder 8, Alice Walker Papers, MSS. 1061, Stuart A. Rose Manuscript, Archives, and Rare Book Library, Emory University. See Karen V. Kukil, Woolf in the World: A Pen and Press of Her Own, Smith College Libraries. Alice Walker, In Search of Our Mothers’ Gardens: Prose (New York: Harcourt, Brace Jovanovich, 1983). Alice Walker, “Wellesley College: Black Literature in America, 1972,” box 92, folder 9 and “University of Massachusetts, African American Literature: Black Women Writers, 1972,” box 92, folder 8, Emory. See Brenda R. Silver, Virginia Woolf Icon (Chicago: University of Chicago Press, 1999), and her treatment of Woolf’s twenty-first century presence in “Virginia Woolf Icon” in The Edinburgh Companion to Virginia Woolf and the Arts, ed. Maggie Humm (Edinburgh: Edinburgh University Press, 2010): 392-413. Sara Crangle, “Out of the Archive: Woolfian Domestic Economies.” Modernism/modernity 23, no. 1 (2016): 141-176. Cristanne Miller, “The Marianne Moore Digital Archive and Feminist Modernist Digital Humanities.” Feminist Modernist Studies 1, vol. 3 (October 2018): 257-268; “Daily Diary of Sylvia Plath,” 1962, box 19, folder 2, Sylvia Plath Collection, Smith College. “SARAH LAWRENCE COLLEGE FACULTY REPORT. Report of ALICE WALKER.” 10 June 10 1964, box 216, folder 3, Emory. Alice Walker, “A Sudden Trip Home in the Spring.” The Complete Stories (1994; London: Orion Books, 2005), 248-261. Bethany Hicok has addressed the role of the women’s college in modernism, particularly with regard to Marianne Moore. See Degrees of Freedom: American Women Poets and the Women’s College 1905-1955 (Lewisburg: Bucknell University Press, 2008). A copy of the order form, filled out in November of 1971 remains in Walker’s papers. Alice Walker, Wellesley College: Black Literature in America, 1972, box 92 folder 9, Emory. Sylvia Plath, Letters of Sylvia Plath Volume 1: 1940-1956, ed. Peter K. Steinberg and Karen V. Kukil (New York: Harper Collins, 2017), 109. For the books in Plath’s library, see Peter K. Steinberg’s catalogue on LibraryThing. On Sexton see Diane Wood Middlebrook, Anne Sexton: A Biography (1991; New York: Random House, 1992), 26. Regarding Walker’s course, see also White, Alice Walker, 222-223 and Maria Lauret, Alice Walker (New York: Palgrave, 2000), 9.